Stained wall on the Manhattan bound side of the 9th St station. Resized photo courtesy of Eye On Transit. Park Slope advocates fear the Fourth Ave. stop at Ninth St. won’t ever be refurbished because of budget problems – so they want simpler fixes made now. “Instead of a high-dollar renovation, we can achieve something tangible for less money,” said Michael Cairl of the Park Slope Civic Council. Their proposal includes refurbishing a spot under the F-line viaduct for use as a newsstand or a cafe. 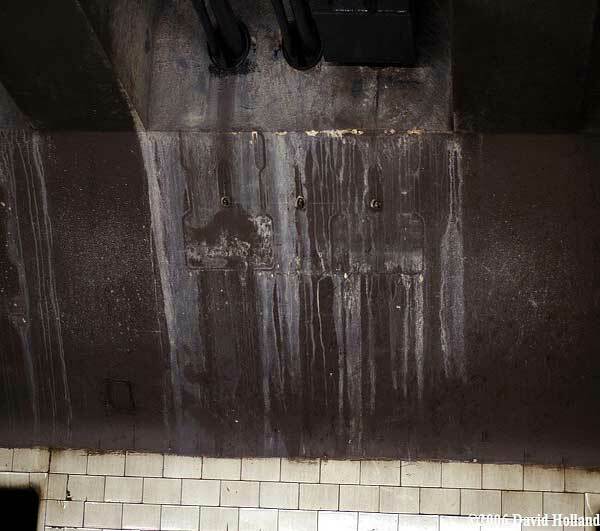 But Metropolitan Transportation Authority officials said they’ve already determined what repairs need to be done, and said the project would begin in 2010. New York City Transit spokesman Charles Seaton said the agency already has worked out “all of the parameters” for the project, which is now slated to be finished by 2012.